An ex-Crimewatch presenter and phone-hacking victim is launching a legal challenge to test the government's commitment to press regulation. Jacqui Hames wants judicial review of the decision by the culture secretary to consult on whether to go ahead with part two of the Leveson Inquiry. "Leveson 2" would examine relationships between police and the press. Campaigners say the consultation has "no legitimacy" and has been launched to delay implementing the measures. What has the government done about "Leveson 2"? Part two had been expected to get under way once all legal proceedings - including criminal investigations - had been completed. But last month the government launched a consultation on whether going ahead with the second part of the inquiry was "still in the public interest". Culture Secretary Karen Bradley told MPs that she wants to seek the views of the public, interested parties and the victims of press abuse before making a final decision. The 10-week consultation is due to finish on 10 January. The government is also consulting on Section 40 of the Crime and Courts Act 2013, which offers press organisations incentives to join an independent regulator and was one of the key commitments made after the first part of the Leveson Inquiry. Many newspapers are opposed to Section 40, because it would force them to pay legal costs in cases brought against them, even when they had not broken the law. Why is Jacqui Hames launching a legal challenge? 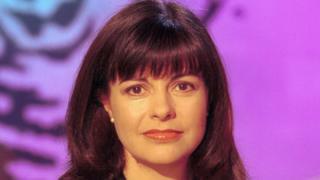 Jacqui Hames became a familiar face on TV as a presenter on BBC's Crimewatch after spending 30 years with the Metropolitan Police. Her ex-husband, David Cook, was a detective chief superintendent in the Met who worked on the murder of private investigator Daniel Morgan. Mr Morgan, who was found with an axe in his head in a south London pub car park in 1987, was business partner to a man with links to the News of the World. Ms Hames alleges that she and Mr Cook were placed under surveillance by the newspaper because of their involvement in investigating Mr Morgan's murder. The judicial review application suggests Ms Hames settled her phone-hacking claim against the News of the World without insisting on a disclosure process because "she believed that relevant information would become available to her as a result of part two of the inquiry". She also claims she was personally assured by former Prime Minister David Cameron that a second inquiry would take place. What is being asked for in the judicial review? Ms Hames is challenging the process by which the government will decide if an inquiry into the relationships between police and the press happens. She argues that the government's failure to implement Section 40 or start the second part of the inquiry showed a lack of will to carry out Leveson's original recommendations. In submitting the judicial review application, Ms Hames is joined by a website called Byline, which allows freelance journalists to publish stories free of editorial interference. Byline has joined Impress, an approved regulator that is funded partly by Max Mosley, the former motor racing boss who was a victim of a newspaper sting. Whereas Ms Hames is hoping to ensure part two of the Leveson Inquiry takes place, Byline is hoping to ensure that Section 40 of the Crime and Courts Act 2013, from which it would benefit, is not dropped because of lobbying from newspaper groups. A third claimant in the judicial inquiry is anonymous. Known as HJK, this claimant had previously brought and settled a claim against News Group Newspapers for voicemail interception by the News of the World, which folded in 2011. The judicial inquiry application was served on 15 December and the government has until 5 January to respond. If a hearing goes ahead, it is likely to take place early in the new year. Many judicial reviews do not end up in court but if this one does, it is likely to frustrate the government's aim to make a clear decision on the next step in the saga of press regulation. Campaigners, including the victims' group Hacked Off, argue that the original recommendations of Lord Leveson's report have not been acted on and ought to be. Evan Harris, from Hacked Off, said the legal challenge came as no surprise given the government's "shameless conduct" of the inquiry. Mr Harris spoke of the government "breaking its promises to victims, intervening to frustrate the will of Parliament and issuing a consultation paper so biased that it could have been written by the Daily Mail or the Sun". "Denying victims of press abuse and responsible journalists access to justice in libel and privacy cases, by blocking section 40, is caving in to the press industry corporate lobby," he added. However, newspaper groups have said their own regulator, the Independent Press Standards Organisation, chaired by former Court of Appeal judge Sir Alan Moses, offers a robust system of self-regulation that retains the independence of a free press. A Department for Culture, Media and Sport spokesman said: "We can confirm that an application has been made to judicially review the consultation. The government is considering its response."